Seymour R. Cray, a computer industry pioneer and the father of the supercomputer, died Saturday at a hospital near his home in Colorado Springs. He was 71 and had been in the hospital since an automobile wreck two weeks ago. Officials at Penrose Community Hospital said the cause was the severe head injuries Mr. Cray had received in the accident. supercomputer at Cray Computer Corp.
Mr. Cray, who as a young electrical engineer at Control Data Corp. in the late 1950s led the design of the world's first transistor-based computer, went on to develop a string of supercomputing machines that were known for their elegance and simplicity, but most of all for their blazing speed. Used first by military weapons designers and in intelligence agencies, Mr. Cray's first supercomputers, notably the Control Data 6600, 7600, and the Cray 1, permitted researchers to simulate nuclear weapons explosions and crack enemy codes. They were soon turned to tasks like weather prediction and oil exploration. Known as an idiosyncratic and quirky computer wizard, Mr. Cray had a remarkable ability to focus on a single challenge: the need to extract more and more speed from each new machine he designed. Mr. Cray's legacy of scientific computer designs stretches as far back as the Univac 1103, which he began working on in the mid-1950s. 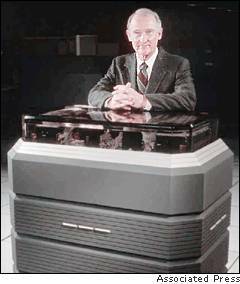 During the 1970s and 1980s, Mr. Cray was instrumental in creating a constant stream of design advances and innovative technologies that were later adopted by the rest of the computer industry. In the late 1970s, Cray Research, the company he founded in 1972 after leaving Control Data, became the world's leading maker of supercomputers, which were increasingly viewed as a measure of national technological prowess and economic competitiveness. That led many governments to invest in supercomputing technologies as a way of creating or protecting a national advantage, whether military or commercial. Mr. Cray left Cray Research Inc. in 1989 to form Cray Computer Corp., which ended in bankruptcy in 1995. In August, Mr. Cray announced that he had formed a new company, SRC Computers, where he was planning to begin the design of the Cray 5 supercomputer. Perhaps Mr. Cray's most significant contribution was an approach to solving the daunting scientific and engineering problems known as ``vector processing,'' which involved chaining together long series of calculations in specialized hardware to expedite solutions. The son of a civil engineer, Mr. Cray was born Sept. 23, 1925, in Chippewa Falls, Wisc., where he attended school, displaying an early fascination with radio, electric motors and electrical circuits. After graduating from high school in 1943, Mr. Cray went into the Army, joining an infantry communications platoon. Arriving in Europe after D-Day, he participated in the Battle of the Bulge. Mr. Cray experimented with electronics in college but did not learn about digital computers until after graduation from the University of Minnesota in 1951, having received a bachelor's in electrical engineering and a master's in mathematics. ``I was fortunate in having an instructor at the University of Minnesota who was looking after me in the sense that when I said, `What's next?' he said, `If I were you, I'd just go down the street here to Engineering Research Associates, and I'd think you'd like what they're doing there,' '' he said in a Smithsonian interview. The Minneapolis company was doing contract work for the Navy in cryptography. ERA was in the forefront of developing digital computers. During his years there, Mr. Cray began to develop his solitary working style and his philosophy of simplicity in computer design. Indeed, while credit is given to IBM for inventing Reduced Instruction Set Computing, or RISC, during the 1970s --- a now popular design approach that calls for simplifying computer hardware to gain speed --- computer historians note that Cray's computers were always designed along RISC lines. At Control Data, Mr. Cray was free to pursue his vision of building large scientific computers. Shunning committees, he felt that the best computers were the ones where a single architect offered a unified vision. In 1975, Mr. Cray was divorced from his first wife, Verene. A year later, he met Geri M. Harrand, whom he later married. In addition to his wife, Mr. Cray is survived by two daughters, Susan Borman of Eua Claire, Wisc., and Carolyn Arnold of Minneapolis; a son, Steven, of Chippewa Falls; a sister, Carol Kersten of Rochester, Minn., and five grandchildren. Copyright 1996 John Markoff <markoff@nyt.com>.